Grilling burgers and making potato salad is a tradition when you are camping. Everyone looks forward to the good times and good meals. But sometimes you’d rather let someone else do the cooking so you can squeeze in some quiet time or save yourself the cleanup. When that happens we’ve got you covered. 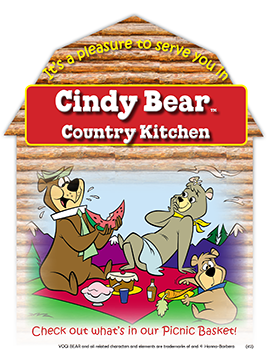 You can satisfy your hungries at Cindy Bear’s™ Country Kitchen. If you’re feeling snacky you can get some of our Wings. They are jumbo sized and you choose BBQ, Butter-N-Garlic, Mild, or Buffalo sauce to go with them. Try some Cheese Sticks, Chicken Fingers, Nachos, or Little Boo Boo™ Burgers. There is plenty of things to try when you want a little something to nibble on. We offer Country Chili and a Soup of the Day. You can pair it with an order of fries, Loaded Potato Skins, or Pepperoni Pizza Fries. They are so, so good! If you are hungry for a salad, we have several options. Try Char-grilled Chicken, Grilled Steak, Traditional Taco, Buffalo Chicken, or a House Salad. They are all made fresh each day with crispy head lettuce, juicy tomatoes, green pepper, onions, cukes, and are served in a crispy homemade tortilla bowl. You’ll have your choice of dressings and will be coming back for more because these salads are made to satisfy. If you’d like a wrap, a burger, or a hoagie, you are in luck. The hardest part will be deciding what to order. You can get a Turkey or Ham Wrap, A Crispy-Meltie Grilled Cheese, A Ranchero Burger with south of the border seasoning, or maybe a Chicken Parmeson Hoagie. That’s just the beginning. You’ll have to check out the menu linked below to get a better idea of what you have to choose from. For Pizza and Stromboli lovers, we have something for you, too. You can get standard pizza fare or specialty pies such as BLT, Taco, or White Pizza. Strombolis come in a range of meats, cheeses, and veggies. So many to choose from. Dessert lovers can pick a piece of pie, an ice cream cone, or maybe a waffle topped with strawberries and whipped cream. It’s your choice and it’s all good. The next time you don’t feel like firing up the grill just come on over to Cindy Bear’s™ Country Kitchen and let us make dinner for you. Then put your feet up and settle in for a beautiful sunset or a campfire with friends.